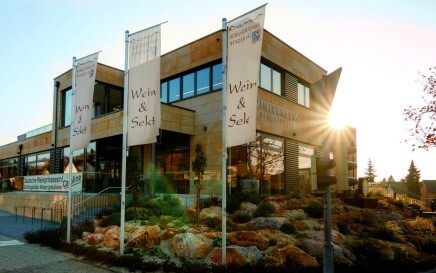 Bergsträßer Winzer eG, Heppenheim is a member of Wein‑Plus and thus supports this wine guide. Thank you! By creating Bergsträßer Winzer eG saved filter, you will see relevant matches on your home screen. The vintners association "Bergsträßer Winzer eG" with seat in the municipality Heppenheim in the German cultivation area Hessian mountain road was founded in 1904 as "Starkenburger Winzerverein". Until 1960, the farm buildings of the Kurmainzer Amtshof served as a permanent establishment before the foundation stone was laid in 1959 for a new, more modern winery and factory building on the Darmstädter Straße. The managing directors are Otto Guthier, cellar master Gerhard Weiß and Dirk Herdner. Today, around 400 members manage along the Hessian, but also along the Baden mountain road in the growing area to bathe in 17 single layers 263 hectares of vineyards. The share in Hesse accounts for around 50% of the total area. The individual layers in the region Hessische Bergstraße are: Schöntal (Alsbach), Fürstenlager and Höllberg (Auerbach), Hemsberg, Kalkgasse, Paul and String Ling (Bensheim), Eckweg, Guldenzoll, Maiberg, Stemmler and Steinkopf (Heppenheim), as well Old castle and scree (Zwingenberg). The individual layers in the growing region of Baden are: Herrnwingert (Hemsbach), Sonnberg (Laudenbach), and Stephansberg (Hohensachsen and Lützelsachsen). The vineyards are processed according to natural aspects, including a natural greening, Environmentally friendly Nutrient Supply and nützlingsschonenderplant protection, A volume-restricted pruning and careful care of the vines yield low yields of only 75 hectoliters per hectare on a long-term average. With 118 hectares of vineyards dominated by the white wine Riesling, followed by Müller-Thurgau (Rivaner), Pinot Gris (Ruländer), Silvaner, Kerner and as a special feature Red Riesling, In the red wine varieties dominated Blauer Spätburgunder with 49 hectares, followed by Saint Laurent, Dornfelder, Frühburgunder and Merlot. 75% of the wines are dry-aged. Specialties are Wines from choice to Trockenbeerenauslese and Eiswein, Every year around 1.9 million bottles are produced. The extensive wine archive comprises around 12,000 bottles from the top-class vintage in 1959. Bottle-fermented sparkling wines and sparkling wines are also produced.